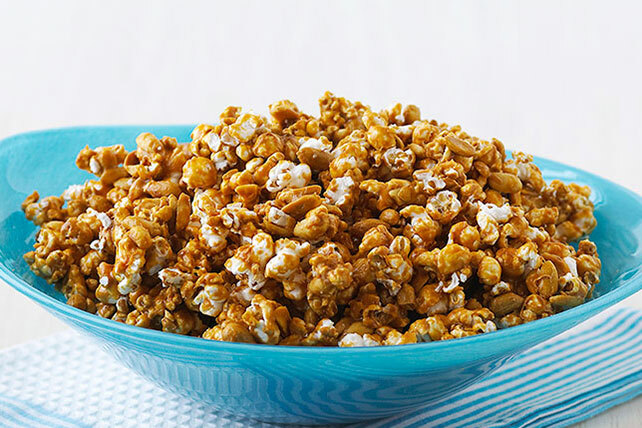 Adding caramel to the mix makes this snack extra special. Preheat oven to 300°F. Place caramels, butter and 1 Tbsp. water in large heavy saucepan; cook on low heat until caramels are completely melted, stirring frequently. Combine popcorn and peanuts in large bowl. Add caramel mixture; toss to evenly coat. Spread onto large greased baking sheet. Bake 10 min. ; stir. Bake an additional 10 min. Spoon onto sheet of wax paper; cool completely. Break apart into clusters. To melt caramels in the microwave, place caramels, butter and water in large microwaveable bowl. Microwave on HIGH 2-1/2 to 3 min. or until caramels are completely melted when stirred, stirring after each min. For easy unwrapping, place carmels in the freezer for 5 min. - the plastic comes right off!